In 1972, Tom Kretsinger Sr., bought a little company named, E.K. Motor Service out of Joliet, Illinois. It was named after a client, Ed Kramer, who was ready to retire. That was before deregulation in 1980, so the real value of the company was its authority. One of the first things he did was to change the name. He wanted a name that had, as its letters, ACT, because he wanted the company to be proactive, or to act. From there he filled in American Central Transport, which has been our name since, but the company is better known as ACT. If you have been around ACT any length of time, one characteristic you will notice is that we are proactive. We think ahead. We anticipate problems before they occur, rather than dealing with problems after they surface. Let’s talk about compliance. For many trucking companies, the thing most feared is a DOT audit. If you are not in compliance, you can find yourself in the middle of a lot of fires as a result. We, at ACT, never worry about an audit because we are “by the book.” We are compliant. So it is fine with us for the DOT to come in whenever they want and look at whatever they want. We were early adapters of CSA and electronic logs, in anticipation of changes in the law. So when the law does change, it is not a change for us. We are early adapters of hair testing. This allows us to know we have no drug users driving our trucks. By these and many other proactive measures, we know there will be no fires. Let’s talk about customer service. Our customers look at us as a great service carrier. What makes us different? We look at something before we agree to do it and ask, “Can we do it?” We make sure we can do what the customer wants before we agree to do it. If we can’t, we are upfront about it, and this prevents a fire. Others charge ahead and deal with the problem when it surfaces, which it always does for those who are reactive. What about service failures? No matter how good you are, things will go wrong from time to time. We watch our loads and try to anticipate any problems. Drivers call us if they have any problems with a load. We are quick to get back to the customer, before the customer even knows that there may be problem. In almost every situation, what could have been a problem goes away. People understand that trucking is not perfect. Given enough time and notice, things can be adjusted to solve problems. What about accidents and lawsuits? Again, ACT is proactive. Our drivers know that they are the only person to determine if they are in an unsafe situation. They know that they have the authority to shut down and call us anytime they feel unsafe. Being proactive in this way prevents accidents. We also have event recorders. These devices protect us from frivolous lawsuits, and we work with drivers to proactively coach out bad habits before they become an accident. As a result of our proactive measures, we have one of the best safety records in trucking. What about the driver? We are proactive with drivers as well. We know that they need our help, assistance and support. We know that their time is important. We pay detention after two hours, whether we collect from the shipper or not. We pay holiday pay, because family is important. Depending on the freight season, we work hard to give drivers preplans as much as possible. Getting drivers home on time is mission critical for us. We know you work hard and need to get home for some well-deserved rest and relaxation with your family. We put home time requests in our computer and monitor those carefully while you are working. These are just a few examples of the many ways the team here at ACT is proactive. We are proud of this part of our culture and practice it every day and we always strive for constant improvement in every aspect of our business. 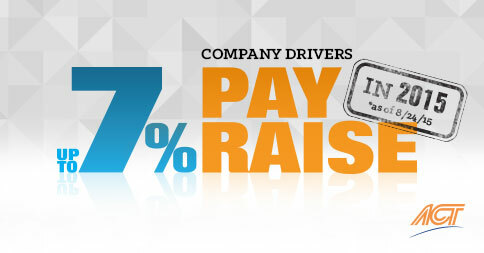 American Central Transport is excited to announce we are increasing pay for both company drivers and owner operators! Effective August 24, 2015, OTR company drivers will receive a $0.02 per mile pay increase, which will be added to the $0.01 per mile anniversary increase given earlier this year. Together, these raises, an overall 7% increase, result in a pay rate of up to a maximum of $.52 per mile paid for all miles, PLUS fuel bonus. Engineered and Dedicated Lane company drivers will receive a $0.01 per mile pay increase. ACT is also adding a $0.02 per mile pay increase for all owner operators who add the Lytx DriveCam system to their trucks. Beginning August 24th, those contractors will receive $1.05 per loaded mile if they have a HAZMAT endorsement, and $0.99 per loaded mile for non-HAZMAT contractors, with $0.90 being paid for empty miles plus fuel surcharge on all miles. “And for our independent contractors, giving them this increase is our way of saying thanks for making our fleet even safer with the addition of a drive cam. We’re very proud of ACT’s safety record and this is an important step in protecting our drivers and the motoring public,” said Wilt. For more information, call American Central Transport at 888-HAUL-ACT (888-883-2809) or visit us online at HaulACT.com. This fall the FMCSA will publish a final rule mandating electronic logs throughout the trucking industry. I don’t like all regulations FMCSA adopts but I do like this one. What is the impact? At ACT, there is no impact as we have used electronic logs for quite a while. There are a handful of independent contractors currently on paper logs and they will have to convert to electronic logs. This won’t affect their operations at all because of our core value of “Integrity.” We are “by the book” without excuse or exception. The only change for them will be learning a new computer. With the right attitude this goes quickly. There are a lot of benefits to electronic logging for those who operate legally within the Hours of Service. The first is the elimination of paper. Paper costs money to buy, it kills trees, and logs must be scanned at a cost and then the auditing function is more labor intensive. With paper logs you get a closer look at the scales. When the logs consist of electronic digits, the filling out and transmission of the logs becomes automated. Often scale houses don’t inspect drivers with electronic logs. With electronic logs, business leaders and planners can see a driver’s exact hours, rather than estimates. This allows more accurate planning and preplanning. With electronic logs, non-driving on duty time is counted at the exact number of minutes as opposed to 15 minute increments required on paper logs. This adds time to a driver’s day and time is money. Electronic logs automatically add up time used and show time remaining, rather than a driver having to do this manually. Form and manner violations which were common with paper logs go away with electronic logs. Late logs disappear as the computer always keeps things up to date and transmitted. With electronic logs, CSA fatigued driving violations go away. This keeps CSA scores low and gets drivers a green light. That makes us and drivers a lot of money as they drive down the road racking up miles while others sit for hours at a scale house racking up violations. ACT drivers run legal. We pay for the electronic log. So there is really no valid fear other than having to learn something new. I asked one of our early adopters a few years back how electronic logs changed his world. He replied that where in the past he always picked the longest load, now he picks the load that works best with his hours. He mentioned that he actually can do better because of this if he plans his day well before logging in. That is easier to do today than in the past, because computers, smart phones and tablets put so much information at our fingertips, including road closures, road construction, routes, fueling, tolls, congestion, time zones and much more. So once the one or two week learning curve is over, it is actually better than paper logs. I have heard over the years many drivers who are at first fearful of electronic logs say after two weeks that they would never go back to paper logs. This has also made ACT better. We know and this reminds us that drivers’ time is important and we have stressed preplanning to help drivers save time and get more miles. A lot of truckers, who object so strongly to electronic logs, have a problem they can’t admit…that is, they run illegally. Some say they don’t want to incur the cost. But, electronic logs actually save money. The illegal business model should offend good drivers. It offends me. These carriers, corner cutters, bid against us for freight with cheap rates. This drives down rates for all. They pay their drivers less, and make them work more and drive more miles by running illegally. This lets them get away without pay increases. Their drivers have to work harder and risk their driving record and CDL for less money. They risk their drivers’ safety and their health. We can all feel good about this change. The electronic log mandate will level the playing field for those of us who do play by the rules. It will help clean up the industry’s bad image they create. It puts a lot of these outlaws out of business because they can’t change their business model fast enough to adapt. Their drivers can’t make any money legally at that low rate of pay and they will lose their drivers. They can’t change their lanes and get their rates up enough to pay their drivers what they deserve. In the future, rates put into bids by all will have to take into account the value of your time and the cost of doing things right….and that is a great thing. As you know last year we tested event recorders. Starting in January we announced that we were deploying them fleet wide by year end 2015. To date we have 167 event recorders installed and are well on our way to meeting our goal. I’d like to give you an update on our experience with them so far. There have been a lot of false and frankly paranoid rumors on the driver grapevine in general about these devices. As with a lot of technology, some folks resist change and improvement. But as more and more drivers adopt the technology they learn the real facts. It only records 12 seconds during an event, something brought on by hard braking or swerving. For the most part, the driver controls whether or not it sets off. We don’t see anything else. It comes with a cover that can be placed on the unit at night if that is important to a driver. It has caught a lot of parking lot accidents and helped our contractors to recover their $1000 deductible. It is a great way to protect our drivers and our company while improving ourselves. We have seen a number of videos that exonerate us and our driver, thus protecting us both. By having the inward and outward facing cameras, lawyers cannot speculate about what our driver was doing at the time. These videos show true professionals doing their jobs and saving lives. Certainly something to brag about, not try to hide. The results are simply amazing. Paying claims and buying insurance are major expense items. This tool has saved a lot more money than it costs. In the first half of 2014, we had 16 DOT recordable accidents and our “Crash” basic was rising quickly. We started ramping up with DriveCam in mid-February of 2015 from 30 units to 167 units now. I’m pleased to share with you that in the first quarter of 2015 we had only 4 DOT recordable accidents and since the first quarter we have had none. In 2014 we saw our “Crash” basic on CSA rise to a score of 70 which resulted in a DOT audit since it was in alert status. Today, it has fallen to a quite respectable 23. During the ramp up period this represents a 45% reduction in DOT recordable crashes. This brings all our scores low, helps us attract and retain business and get our drivers green lights at the scales. This saves all time and money. When we are involved in an accident, insurance companies create a reserve which is an estimate of the amount of money it will take to defend and settle a claim. In addition, we create reserves to pay the deductibles and self-insured amounts not covered by insurance. Last year at mid-year we had $640,000 in reserves for accidents. 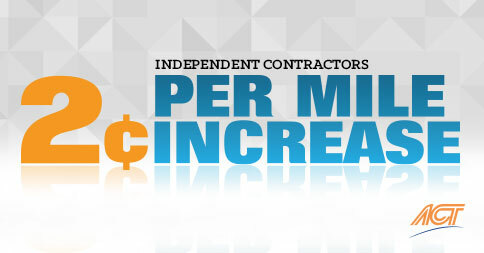 As of mid-year 2015, that was down to $260,000, a 60% reduction! Folks, this is real safety and real savings. And this is with only a little more than half our trucks equipped. DriveCam records only 12 second during an event, 8 seconds before and 4 seconds after. Through film review our drivers have reduced the number of recorded events by 60% and the number of severe events by 64%. We had one driver who reduced his hard braking events from 40 per month to one or none. This is safety improvement you can see, hear, feel and touch. It is very real and gives ACT a big competitive advantage. We are seeing our work in the safety department shift from spending hours handling claims to proactive work preventing accidents. And your typical driver has less than one minute of film recorded and sent to us each month. Together, we are all responsible for accidents and live in a legal environment which is unfavorable and often unfair to truckers. Now together, we are making real strides in protecting ourselves and the motoring public. Thank you for your help on this project and being the true professionals that you are.